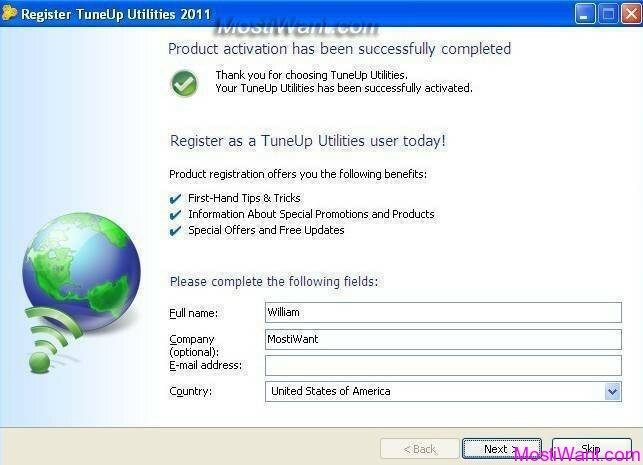 Updated [July 16, 2013]: TuneUp Utilities 2012 Full Version Product Key Free for a limited time. No matter how properly you use a computer, registry entries are created, temporary internet files pile up, disks fragment and the results are inevitable: The more you use a PC, the slower it gets. 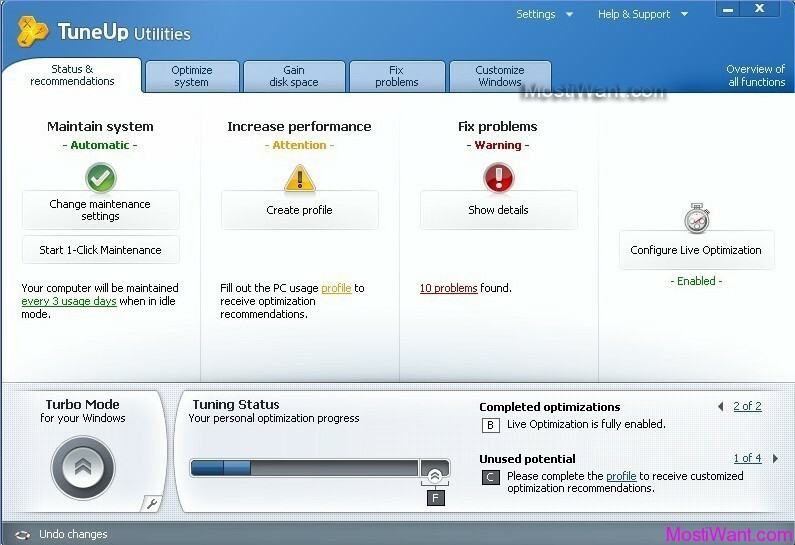 If you want to speed up your Windows and bring back the performance you used to get when it was freshly installed, then check out TuneUp Utilities 2011 from TuneUp Software GmbH, which is able to take care of all these and dramatically speed up Windows performance. 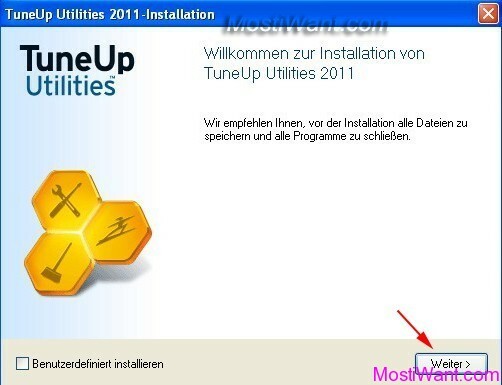 TuneUp Utilities 2011 is one of the best and most powerful tweaking and customizing utility for Windows system. With a number of new tuning features, including TuneUp Program Deactivator, and enhancements of its trusted optimization tools, the intelligent software developer is enabling users to solve performance issues with their operating system and other areas, such as third-party software. Status & recommendations – The intuitive Start Center with a fresh look and feel gives you complete control and access to the most important tuning steps at a glance. Optimize system – Get rid of those PC brakes and drop the dead weight in programs: for maximum speed whether working, surfing, or playing! Gain disk space – Find and remove large resource hogs and annoying data trash to make your PC run even more efficiently. Fix problems – Fix the most common Windows® problems, scan your hard disk and restore deleted files. Customize Windows – Change the visual appearance of Windows® to match your style and safely modify over 400 Windows settings. Overview of all functions – Professional users have direct access to 32 optimization tools TuneUp Utilities™ 2011 offers. TuneUp Utilities 2011 is not cheap, $49.95 is a fair amount. But there is a promotion going on, which will allow you to get this product for free of cost. Bellow are the simple steps which will enable you to get the free Full Version Product Key / Activation Code of TuneUp Utilities 2011. TuneUp Utilities 2011 is not the latest version because the developer has released TuneUp Utilities 2013 sometime ago. But this does not mean in any way that it is useless or obsolete. The features available are still current and compatible with the needs of a regular user. The old promo (shared on September 19th, 2011) has expired now. But I have found another new working offer for TuneUp Utilities 2011. Unfortunately, the new offer is for German version only, so the basic user interface is in German language. For those of you who want a English version, please check our the “Change Language” section at the end of the post. 1. 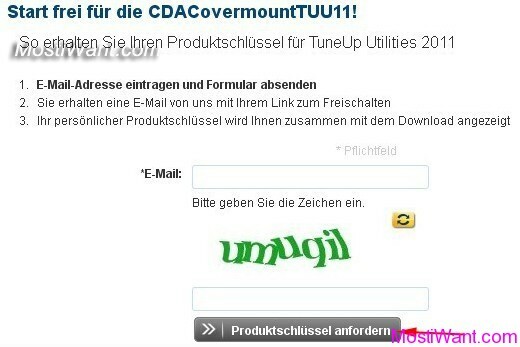 Visit the TuneUp Utilities 2011 Giveaway Page, enter your email address and CAPTCHA code, then click on the “Produktschlüssel anfordern” button. Note: The e-mail address you entered must never be used in any promotional activities set by TuneUp Corporation. Note: This giveaway can end anytime. If the giveaway link doesn’t take you to the online form like the one within the screenshot, then it means the giveaway has no longer alive. 3. They will immediately sent you an activation link in the Email address that you’ve given. Click on that activation link and you will be redirect to a page that contains your free product key of TuneUp Utilities 2011. If you do not receive the e-mail, please check the spelling of your e-mail address and check whether the e-mail has ended up in your junk folder. Due to increased demand, delays in mail delivery cannot be ruled out. This product key only works in German version, so the basic user interface is in German language, but we have a trick to change it into English easily. 1. 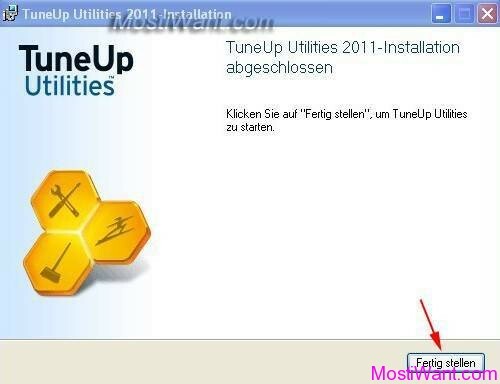 First download and install TuneUp Utilities 2011 English Version: TuneUpUtilities2011_en-US.exe [English, 19.9 MB]. 2. 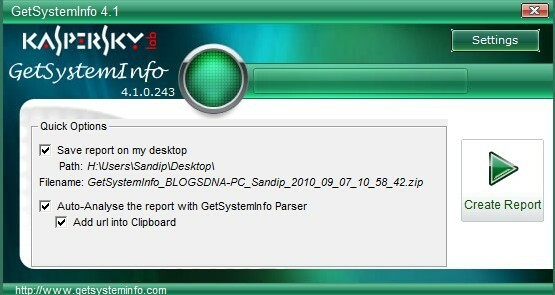 Open my Computer and navigate to following path: C:\\Documents and Settings\\All Users\\Application Data\\TuneUp Software\\TuneUp Utilities 2011 and copy the language folder “en-US” to a safe place. Note that the “Application Data” is a hidden folder. 3. Then uninstall the English version. 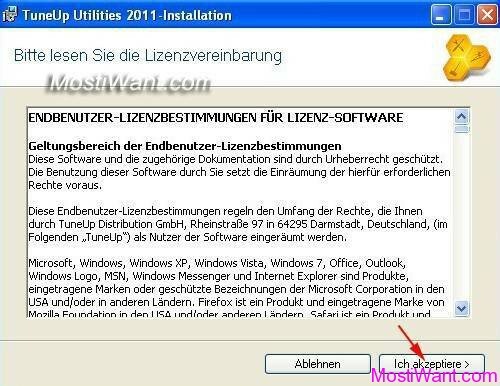 Download and install TuneUp Utilities 2011 German version: TuneUpUtilities2011_de-DE.exe [22.9 MB]. Don’t worry about Germane language, Just follow the below screenshots. 4. After finishing the installation, open my Computer and navigate to following path again: C:\\Documents and Settings\\All Users\\Application Data\\TuneUp Software\\TuneUp Utilities 2011 and copy the language folder “en-US” you saved in step 2 to here. 5. 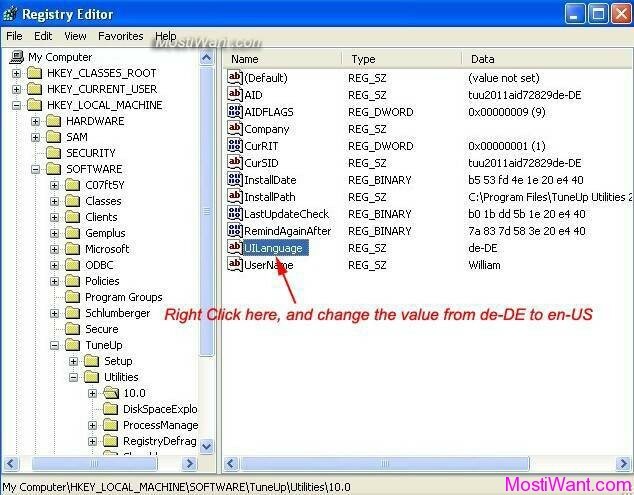 For Windows Xp, go to Start > Run , type Regedit and click Ok; For Windows Vista/7, type Regedit in the Start Menu’s Search box to Launch Regedit. Then Navigate to HKEY_LOCAL_MACHINE \\ SOFTWARE \\ TuneUp \\ Utilities \\ 10.0 Change (Right Click and Modify) the value of UlLanguage from de-DE to en-US. 6. Restart your computer. Run TuneUp Utilities 2011, and it should be English now. Use the product key you have received to convert your version of TuneUp Utilities 2011 to the full version. Updated [January 30, 2013]: This is not a new promo but lasts for a long time . It is still working and many of you may need it. I change the date published for this post to make it up. Hi, thanks for posting this up! I have trouble finding the en-us language file, would you mind posting up the zip folder for it? @Yvonne, Sorry for the delayed response but do you still need the en-us language file? yes please! nah you are too kind, Im ready to wait! If you have any problem, please feel free to contact me. You are always welcome. Thank you William! A very good description! Thank you William, your work is much appreciated. And thanks for the clear language change instructions. Thanks but most people already got their license keys for v2011. The old(previous version) is TuneUp Utilities 2012. 1. When is the promotional giveaway for TuneUp Utilities 2012? 2.Will you post in the blog when this promo offer is available. 1. This is decided by the developer. can u give me product key tune up 2012 ? install TuneUp Utilities in the same language as the product key you acquired. Tested now…it is working but install OK only using PL language…on ITA language give an incorrect language serial error!!! Hi Laugh, as we have updated in the post: the promo may have expired or the promo site may have encountered a technical problem. Don’t bother with this. Tune-up doesn’t give you a code. Instead you receive an error from the link provided in your email. Waste of time. Good product otherwise. @Nathan, the promo may have expired or the promo site may have encountered a technical problem. 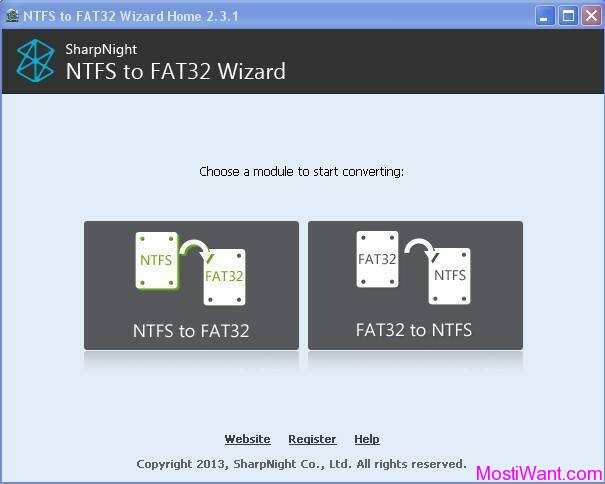 i want to know the validity period of this Software. is it for one year or Three months…? I tested one for my own computer and it worked. Hope you can use them. Feel free to post here if you want me to post more keys. Thank you very much really it’s working and beautiful………. ‘will try this but anyway thanks for the codes. Thanks brother.The first one works perfectly. the site say This promotion is not currently active, no new product keys are being issued! If you have already registered your e-mail for this promotion, you can request your product key again. did u use some keygen to have these keys.. why its block not working ? The promotion is over (unfortunately!) 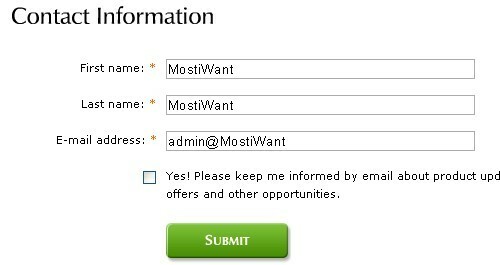 I used the user information given by Most i Want. It is valid for registration. Thank you so much again. he masked the key in first picture, but forget to mask the second one. Tune Up Utilities is the best software in its area. Thank you William Most i Want. this one is stopped. idk why. Why the promotion is not active? It’s finished? good giveaway. thank u very much.